Is there anything better than sitting down to Thanksgiving dinner with all the trimmings? If you do it right, you practically need a separate table just for the assortment of food. Perfectly-basted, golden turkey, mouthwatering stuffing, and creamy mashed potatoes are just some of the dishes that make this US holiday a favorite of many, and you shouldn’t have to miss this tasty meal when you’re traveling abroad. We’ve put together a list of the top places to get a traditional Thanksgiving meal outside of the United States, so you don’t have to feel homesick around the holidays. A literary and culinary epicenter for expats, the Globe Bookstore & Café caters to Americans looking for a taste of home. The daily menu here is American-influenced and it’s no surprise that this establishment offers a mouthwatering turkey dinner to celebrate the Thanksgiving holiday. Reservations are encouraged but not required to eat and give thanks at this trendy café. Drop in anytime from noon until close to satisfy your turkey cravings. For a decade or more, Prague has been unofficially regarded as Europe’s coolest city — and it’s not about to relinquish the title. The world of literature — or just coffee — is the backdrop at The Globe. After a steady walk back across the Vltava, there’s strong coffee and a mid-morning brunch at The Globe Bookstore and Café, one of Prague’s coolest expat hangouts since opening in 1993. 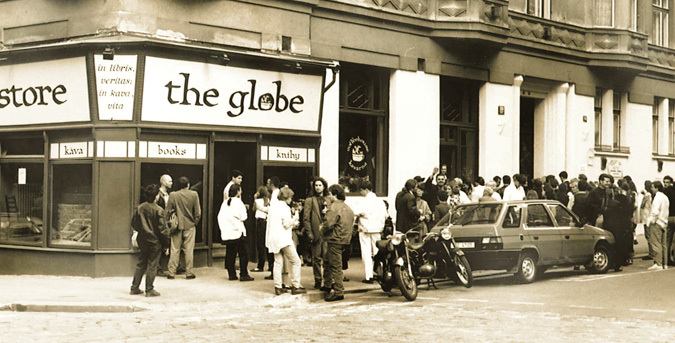 No matter how you feel about The Globe Bookstore & Café’s surly wait staff and hit-or-miss menu, there’s no denying its role as an institution among the Czech capital’s English-speaking expatriates. Countless coffees have been drunk, words written and ideas debated in the Globe, Prague’s famous English-language bookstore and cafe. Literati like Alan Ginsberg and Ludvik Vaculik have read there, and it’s has become internationally known as a meeting place for backpackers and locals alike. Is this the end of the bookshop, or just a new chapter? Bookstores around the world have been shutting their doors in the face of what looks a lot like publishing Armageddon. What’s a bibliophile to do? It was the New Yorker cover that started it all. In December last year, the front of the magazine of the chattering literary classes showed a young bookshop attendant in takkies pointing a perplexed older man in a suit towards a two-tiered bookshelf.